At the next meeting of the Ellingham Parish Council, called for just over a week later on Thursday 13th December 1894, Henry Youngman was elected Chairman; declarations of acceptance of office were sworn by the councillors; Thomas Brown was appointed clerk to the council on a salary of £2 yearly; Messrs Gurney and Co of Bungay were appointed treasurers for the council; Rev. Davey and Frederick Jones were appointed trustees; meeting dates for 1895 were arranged; agreed that 10 cwt of coals be given to the poor of Ellingham and that Mr Youngman would hand out the coal tickets. Ellingham Parish Council was underway. Having said this little is recorded in the minute book about the work being carried out by the council until the matter of control of the Ellingham charities takes prime place for a number of years. The first Parish Councils were elected on an annual basis in April and the practice continued until the Parish Councillors (Tenure of Office) Act 1899 changed this to three years. So from 15 April 1901 our local Parish Councillors were elected for a term of three years. Nowadays the term is four years. In 1895 it is again recorded that half a ton of coal be given to the poor of Ellingham, which seems to confirm that the charity funds were available to the Parish Council. Other than that there is only the annual appointment of village constables and overseers being noted. However, on March 8th 1915 a resolution was passed by the councillors present; “That the new Scheme for the administration of the Parish Charities should be applied for.” On 14th February 1916 a letter was written by the Parish Council to the Charity Commissioners asking them to postpone the introduction of a new Scheme for the charities until the new Rector arrives; Rev. Harold Holmes Blair now vacating the post. How innocent they were, but how could they have known how the new Rector, Rev. John Thomas Hendley, would repay this deference. In December of 1916 the Parish Council postponed any decision on the new Scheme until after a Parish Meeting. So in February 1917 we see a decision made; “The Parish Council in conjunction with the Parish Meeting agreed to oppose the Scheme of the Charity Commissioners.” Furthermore, at the same meeting the Councillors decided unanimously to take over the Ellingham Charities and to appoint their own trustees. In March 1917 the Parish Council decided; “… that the Parish Council do not feel inclined to call any more meetings until the Parishioners find out what the money was left for.” In both April and May 1917 the Parish Council declares its strong opposition to the Town Lands being divided up. Quite clearly, the 1894 Act was a major milestone in local government for the whole of the country and the consequences for Kirby Cane and Ellingham are still being felt today. The Act transferred the powers that had for centuries been exercised by the church, vestry and overseers into the hands of the newly elected councillors. What are the assets involved? Investments which comprise of monies left by benefactors in the past and the proceeds of land and property sales. The land is quite easily identified from the tithe maps and the Land Registry: there are 67 acres of which 25 acres are land that was given at the time of the enclosures. 1. Who has the legal title to the lands and investments? All of the evidence from the historic record would seem to show that no land was ever left for ecclesiastical purposes. Other than very minor monetary bequests, there were no ecclesiastical charities in the two villages. This was confirmed by the Charity Commissioners in the early 1900’s. The legal title therefore rests with the Parish Council. 2. Who manages the investments and the capital? It is the trustees who manage the charities. As those with the legal title to the land and assets, the Parish Council appoints the majority of trustees to each charity. The wishes of the original benefactors concerning the distribution of income to the “poor”, or whatever good cause, will be a management requirement upon the trustees of the property involved. These days it is only possible for the trustees to vary these wishes by gaining the approval of the Charity Commissioners. We should also mention the Sand and Gravel Charity which was given to Ellingham Parish Council in the 1970’s by a local benefactor. Other than the major row over the charities mentioned above and elsewhere, we see very little of note in the first minute book other than elections and the names of those elected. Constables were appointed and in 1899 a precept of £5 was set. Meetings were held in the “school room”. Ellingham United Charities accounts are reported annually and trustees appointed. 1937 was the year of the coronation of George VI and the Parish Council agreed that “testaments” be given to all the children. The 1953 coronation of Elizabeth II became a major item for discussion at a number of council meetings. The ideas included holding a party, having an evening concert and souvenirs for the children. Eventually it was decided that there should be souvenir spoons for each child, tea in the school, sports on the Rectory Meadow and prizes for the best dressed house and fancy dress parade winners. Twenty-five years later in March 1977, in the Queens silver jubilee year, it was decided to plant trees on the playing field, to have a buffet tea and to give crowns to the children. The 1953 coronation was also marked by the purchase of a seat which was to be sited outside the memorial hall. There were plans to re-site the seat to the playing field in 1972 but the Women’s Institute objected. These objections were eventually over-ruled and in 1974 the seat was moved. The saga ends in 1976 with a letter to the council from the WI “regretting the destruction of the seat at the playing field”. 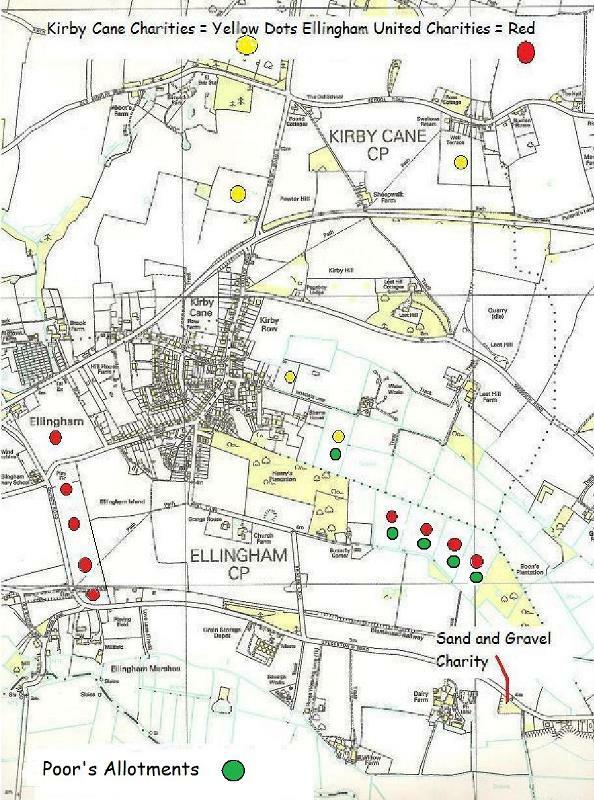 Playing Field: A joint meeting of Kirby Cane Parish Council and Ellingham Parish Council was held in April 1939 regarding a site for a playing field that had been put forward by the Town Planning Officer in Norwich. The site was agreed but we are not told where it was. Obviously nothing was done at this time for in 1967 there is a discussion at the council meeting about hiring the Rectory Meadow as a playing field for the children. It was decided to ask the football club to hire it for their use instead. Staying with the football club; it was suggested in May 1978 that the field next to the playing field be used for the football club. However, the local farmer refused to give up the land. It would seem that this is the land managed by the trustees of Ellingham United Charities (EUC). By 1968 there was a groundswell of parents asking for a playing field for the children. The allotments site was proposed for this purpose and the three remaining allotment holders were informed. It was noted that they were entitled to a year’s notice. A number of alternative sites were put forward at a public meeting held in July 1968 and owners were contacted. However, in August 1968, so few people turned up that it was decided not to do anything more until a final meeting could be called in November of that year. At the November meeting it was agreed that the allotment field be leased from the trustees of EUC and a small committee was set up to get the process underway. Final agreement with the trustees came in March 1969 with an initial rent of £1 and £5 per annum for the next four years. The lease was extended to 21 years in 1970 and planning permission and grants obtained. By June 1971 all was well enough in hand for a formal report to be made to the council concerning rules, committee make up, objects, accounts, insurance and meeting frequency. The Second World War does not get a mention at all in the minute books other than a brief note that there was no agreement to set up a “forces fund”. School Managers (Governors nowadays) have been appointed regularly by the Parish Council up to recent times. In the early 1980’s the coming of the village by-pass saw meetings held between Ellingham PC, Kirby Cane PC and Broome PC. The blue/green route, as proposed by Norfolk County Council, was agreed to. There was talk in the 1980’s of having a new village hall but this was soon dropped because of the problems of getting sufficient funds. The most recent of the “Minute Books”, where minutes were handwritten, contained a rolling agenda at the back which served as an aide memoir for the clerk. This was very useful in-as-much as it protected the agenda of the Parish Council ensuring that all responsibilities were met and that items were not lost. Appointment of trustees to the EUC: This was on the basis of one trustee appointed for a four year term every year on a rolling programme. Appointment of trustees to the Sand and Gravel Charity on the same basis as above. Appointments to the Planning Committee. Reviews of funding towards; Kirby Cane Memorial Hall and Ellingham PCC. The records for Kirby Cane Parish Council have now been located. They are at the Norfolk Record Office. 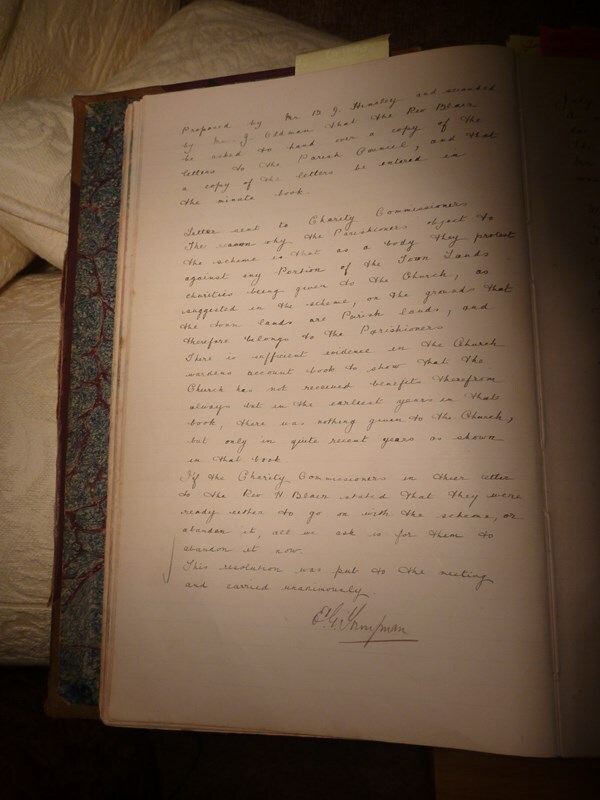 Here is part of the opening page and there will be more to follow as and when researchers can get to the Record Office. 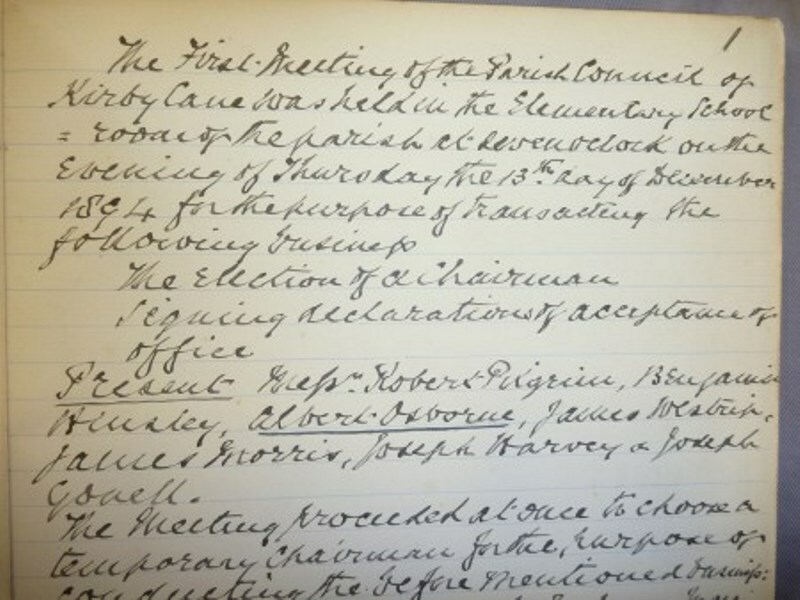 The new Parish Council for Kirby Cane met on Thursday 13th December 1894. The new councillors were Robert Pilgrim, Benjamin Hinsley, Albert Osborne, James Westrip, James Morris, Joseph Harvey and Joseph Youell. Mr C G Kewball was elected Chairman, in his absence it seems. Here are a few pictures of “illuminated” pages by Mr Chirola the then Clerk to the Parish Council. Regarding Parish Land and Allotments for the poor in Kirby Cane; the wording in the Enclosure Award is almost identical to that for Ellingham other than the identification of the Five Acres that lie down Newgate Lane. Other Parish Property was again protected by the serving Kirby Cane councillors in 1981 when a builder crossed the land by the bus shelter in order to build the bungalows there. The bus shelter belongs to the parish as does 40 feet of frontage at that point. A settlement was reached with the builder giving a right of way across the parish land for the sum of £300. The deeds to the bus shelter were deposited with the deeds to the Memorial Hall at the TSB in Bungay in 1986. Recently (2009-14) there has been much discussion concerning what is now called “The Quarry” at Leet Hill. There has been controversy about planning approvals and the failure of quarry owners to meet planning deadlines and requirements. Here we can couple this with an entry from the minutes of Kirby Cane Parish Council on 17th April 1934: called then the “Parish Pit” it was sold for £30 being described as “practically useless” and the proceeds given to Kirby Cane Charity funds. May 15th 1967 sees the mention of the deeds for the Memorial Hall being handed to Kirby Cane Parish Council. On 20th November that year the deed of appointment of new trustees for the Memorial Hall being handed over by Captain Simon Crisp. The Parish Council paid the bill for the preparation of the deed which was £7 17 shillings. The first meeting to be held by Kirby Cane Parish Council in the Memorial Hall took place on Tuesday 16th April 1968.